Yeeees! Finally! x_x I have my internet back! I'm so happy! I'm not happy! I'm ecstatic! Esctatic! No! More like I'm euphoric! Yes! That's it! Err... but I bet you guys didn't want to read that, ne? The theme for this one was Euphoria and I really had a hard time deciding what I wanted to wall and how to express such a complex feeling. In the end, I came to the overall conclusion that finding something (or someone) you've been desperately looking for almost forever is a reason enough to experience euphoria. Thus, this wallie was born. 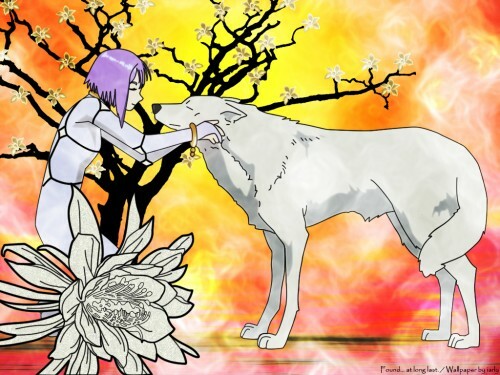 At the time, I was watching Wolf's rain and truly, Kiba and Cheza were just the very obvious choice. I used about 5 or 6 scans and screencaps to trace the outlines. It's mostly that, and even if I tried to keep it simple, it turned out not to be quite so, but I liked the result. At least, most of it, considering it's the first time I ever traced anything. Still, I'm glad I went for it. Now I get much more interesting ideas! Ok, enough babbling. I just hope you like my wallie! Ja ne! I'm a proud member of these groups! So beautiful, thanks a lot for sharing your awesome work !